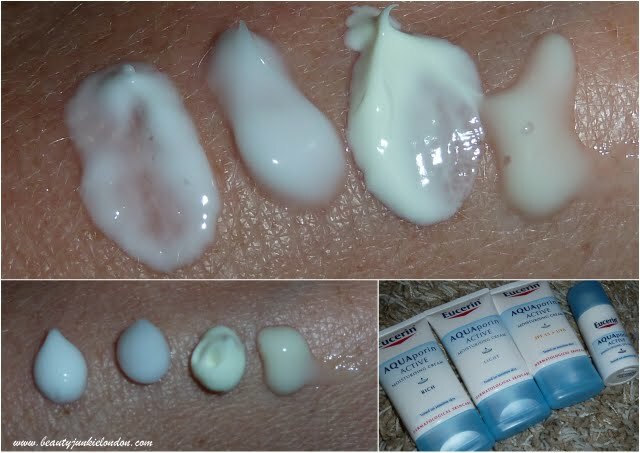 When I think of Eucerin I tend to think of eczema or nappy rash, or generally problem skin. I’ve used the brand in the past when I’ve had stress related skin flare-ups and it’s always been really reliable at calming my skin down again so I’ve always thought of it as the almost medicinal range of skincare. Which makes sense, having read the history of the brand it’s over 100 years old and was created as a medicinal product – it was seen as a revolutionary product. So when I heard they were bringing out a range of daily skincare I was quite interested what this would be like – would it be specially for sensitive skin or would it be more for all skin types? Eucerin AQUAporin Active: Rich, Light, SPF15 +UVA, Eye Cream. The AQUAporin ACTIVE range includes three moisturising face creams, in ‘rich’, ‘light’ and ‘SPF 15’ versions. Plus a moisturising eye cream to help soothe tired eyes. My first impression was that there’s not much difference in the texture of the light and rich versions (although on use I can tell the difference). The SPF cream is nice and creamy, but still light and the eye-cream is lovely and gel-like. L-R (swatches) rich, light, spf, eye cream. AQUAporin Rich (£13.27 from Boots) – ideal for nighttime. Really moisturising but feels light to use – perfect for dry skin that needs a boost, but nothing too heavy. AQUAporin Light (£13.27 from Boots) – another light feeling cream, but ever so slightly less moisturising than the rich version. AQUAporin SPF15 (£13.27 from Boots) – So happy they have this in the range, as I really like the overall textures of these creams it’s fab to have an SPF version for daytime as I try 99% of the time to wear an SPF in the daytime. I have to say, I’d love to see a SPF30 version too! AQUAporin Eye Cream (£13.27 from Boots) – Lightweight and absorbs really quickly, this is really refreshing for tired eyes – and that’s coming from someone who is glued to a laptop screen for far too many hours a day. Find out more about the Eucerin range from the website. Sponsored post via Handpicked media.